Student and family data in Staffroom can be automatically sent to the Karri Payments system. Karri is a mobile payments system that your school can use to gather payments from parents. More information about Karri can be found here: Karri Payments. NB: Warning enabling this integration will send student and family data from your Staffroom site to the Karri Payment system. Sharing data with third parties is governed by POPI legislation in South Africa so please ensure that your school has complied with necessary requirements before using this feature. Karri uses Staffroom to get family contact details about your school’s families and to keep this data in sync with what is on Staffroom. This removes the need for school’s to keep family contact data up to date on both systems manually; updates to contact details need only be made on Staffroom and they will automatically reflect on Karri. Limited student and family data for all current students is sent to Karri. The Karri system gets your data from Staffroom; no data is sent from Karri to Staffroom. Updates may take up to 24 hours to reflect on Karri after they have been made on Staffroom. Once the integration is enabled you will be able to see an integration key. 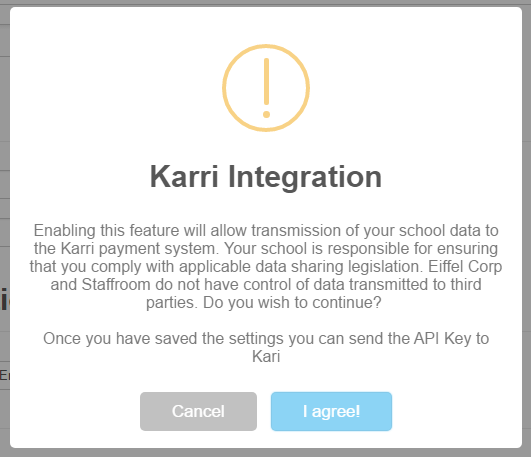 The API key shown in the Karri Integration section of the settings page above (you can use the copy to clipboard button to copy this). Your school’s Staffroom site address e.g. echs.mystaffroom.net. If you need more help enabling this integration on your Staffroom site, please contact the Staffroom support team.